Native plants thrive under local conditions and require less maintenance once established. That means less water, less fertilizer, and less pesticides which makes for a healthier Earth. Planting native plants is also good for beneficial insects, birds, and a whole host of wildlife. Less water – In a typical yard, the lawn is the most thirsty part. You can grow drought tolerant native plants to reduce water consumption. 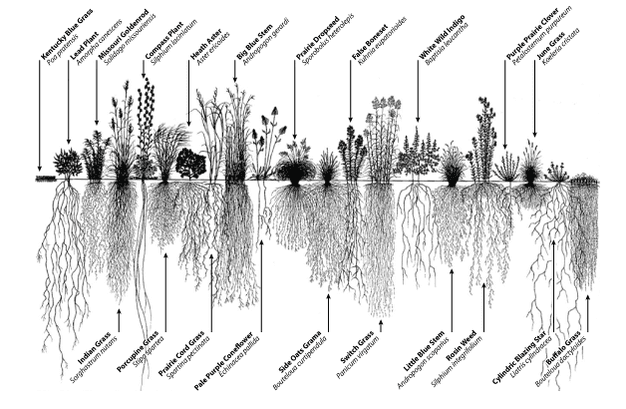 The deeper roots of many of the native plants allow them to reach further for water, help them withstand periods of less rainfall, and to reduce erosion during heavy rain. • Group plants with similar water needs together. It helps conserve water and makes sure that plants are not getting too much or too little. • Water your garden plants only when you find the soil is dry 1-2" under the surface and then water slowly and deeply. It will help roots grow deep and plants become less dependent on extra watering. • Install a rain barrel to collect rainwater. You can order a rain barrel through The Conservation Foundation. Less fertilizer – Native plants require less fertilizer because they prosper in local soil. Fertilizer from home landscapes leaches into nearby ponds causing algae overgrowth. This means less oxygen for aquatic creatures. Planting natives will reduce the amount of money and time spent on fertilizer as well as helping Earth and Earth’s creatures. Less pesticides – Pesticides can be harmful to children and pets, but pesticides also reduce the numbers of beneficial insects as well. A single ladybug can eat as many as 60 aphids per day, but ladybugs also eat a variety of other pests and their larvae. Save on pesticides and save our beneficial insects while helping Planet Earth. Less maintenance – Native plants, once established, will grow better and require less attention than plants that are not suited to local conditions. That means more time for you to enjoy nature. Pick the right plant for the right place and try planting native. More pollination - Pollination includes pollen carried from flower to flower by wildlife or pollen carried through the air. Native plants serve a vital function in our local ecosystem by providing much-needed food for birds, bees, bats, moths, and other wildlife that pollinate the Earth’s plants. More education for children – A recent two-year study found that “more than 10 percent of children haven’t spent time in any natural setting for at least a year.” By using native plants in your home landscape, you can provide a rich education in Earth-friendly living and encourage your children to enjoy nature. More natural – You can help create a pocket prairie in your yard. The Growing Place carries 150 varieties of native plants. Many of those plants are sourced close to home, within 80 miles. You don’t have to plant a field of wildflowers to grow native plants. Add them to your perennial gardens. They complement hybridized plants well. Plant a butterfly garden, a rain garden or a small prairie-like area to replace a bit of grass. You'll reduce the area you'll have to mow! To help you jump in, visit us on Saturday for our "Plant Them and They Will Come" talk at 11am and 1pm in Naperville and don't miss out on our 2" Native Plant Special! While supplies last you can purchase a wide selection of 2" Native plants for $2.50 each (regularly $3.99, Limit 20) Happy Earth Day! We're here to help you go native!